In ‘96, Arnold Schwarzenegger decided to open his then-new movie Eraser on my birthday, and I could see no better way to celebrate my birthday than with the opening of a good old Arnie action flick. So after all my friends and I engorged ourselves at a local italian restaurant we headed off to Crossroads Cinemas in Bellevue to watch the show. Since it was the opening of an Arnie flick, and a Friday night, we decided to get there a bit early so we could get seats - and good thing too, we still ended up sitting way over on the side. With plenty of time now on our hands, we sat there amusing ourselves by lampooning the endless loop of advertising slides showing on the screen. In no time at all, the theater completely filled with people. John continued calling for attention and by and by he got it - all 500 people quieted and listened to him. Then he started. “Today is my friend Rob’s birthday, and I think it would be great if you join me in wishing him a Happy Birthday.” He then began singing, followed immediately by my party friends. By the 2nd “happy birthday to you”, the ENTIRE AUDIENCE was singing along. They concluded & I meekly took a bow. As I sat down, I told John, “I don’t know how I’m going to get you back for this, but I will.” Then “Thanks John”. And thus was my most memorable birthday ever - the day John led 500 people to serenade me - thanks to John’s generosity and outgoing manner. Another good John story - check out Bruce Oberg’s recounting of The Group Admin from Hell. Another favorite photo; this one capturing both Johns at my birthday party in ‘94. It is one of my favorites because it has both Johns in it and because it captures something of their personalities. John P. is showing John K. the old trick of putting your fingers together & crossing your eyes so as to make your fingers look like hot dogs. 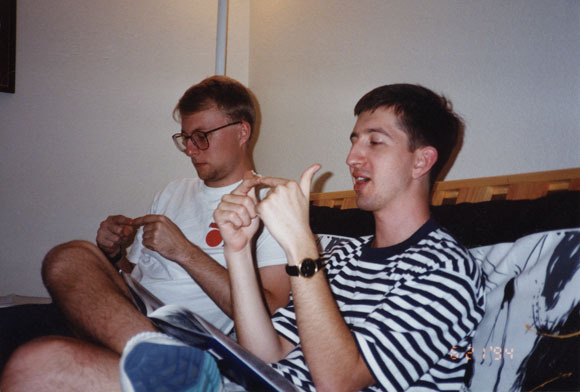 John and Robert Lee play piano together at The Plaid’s year end party during our senior year of high school (‘88). (“The Plaid” was our school newspaper). This is one of my favorite pictures because it shows John doing one of the things I always admired about him (excellent improvisations at the piano), and it’s the only time I got to see these two excellent musicians playing together. (Robert has gone on to write musicals on Broadway). First, you will need to register on the site. To register, click here. After you have an account and have logged in, go to the Control Panel. Body: This is where you can enter the bulk of your article. If you want to insert a picture, click on the “File Upload” link above the Summary box. That will create pop-up window that will allow you to upload a file. GIF and JPG images are allowed. You want the image to appear in the “Body” field and you can resize the image if you want to. If you do not want to resize the image, you can simply close the pop-up window. The rest of the fields you do not need to complete. You can assign a category to the article by selecting a Category on the bottom right hand sidebar. 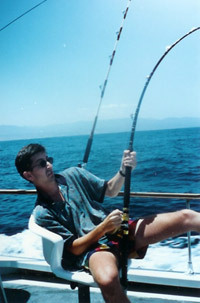 From our trip to Cabo San Lucas in 1994.